Your skin is one of the most important parts of your body; as such, a thorough dermatologic examination can provide a wealth of information about your body’s overall health if you know what to look for. Often times, people become worried or confused when they see certain spots on their body that were not there previously, and without professional information and medical expertise, it is impossible to make the right choices with regard to treatment. At Long Island Dermatology, we perform skin cancer screenings for all our patients. Annual skin checks are the best way to identify changes in your skin and to become familiar with the most common warning signs. These skin exams generally result in early detection of skin cancer. Additionally, you can discuss any of your skin care concerns during this appointment as well. Our skin exam services are designed to be all-encompassing, so you can receive all of the information you need in one visit. Whether you are worried about potential skin cancer or just want more details on your skin, Long Island Dermatology has you covered. 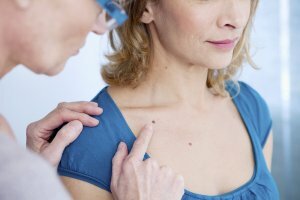 Moles and skin marks that suddenly change are cause for concern, though sudden changes are not the only warning signs of which you should be aware. During your annual skin exam, we show you how to distinguish benign moles from and moles that can be problematic, teaching you how enabling you how to be able to perform your own self-checks at home. At Long Island Dermatology, we want to empower and educate our patients and bring them up to speed on how to check themselves, in addition to providing top-level care at our facility. We believe the best medical care comes from a close relationship between doctor and patient. We know it can be troubling and worrisome to have strange spots or moles on your body, and we take our annual skin screenings and tests seriously. Providing our patients with accurate information and educating patients on how to perform self-exams helps our patients stay up to date with their own medical care, which is an essential element to staying healthy. At Long Island Dermatology, all of our skin cancer patients are seen by an MD, not a PA, which means you are guaranteed to receive expert diagnostics and treatment options. Our doctors on staff have over 20 years of experience treating many different levels of skin cancer, and our Hopkins background means we have strong expertise with regard to early detection and management of skin cancer. We aim to detect any irregularities early on so you receive the treatment you need and can move forward with your life. The best way to prevent long-term problems with skin cancer is to discover any trouble spots early. By utilizing our annual skin checks and performing self-screenings at home, you afford yourself the best chance at minimizing any potential problems with skin cancer. Schedule your annual skin exam with our Rockville Centre dermatologist by calling (516) 272-4193.